Entries tagged with “John Tilbury”. 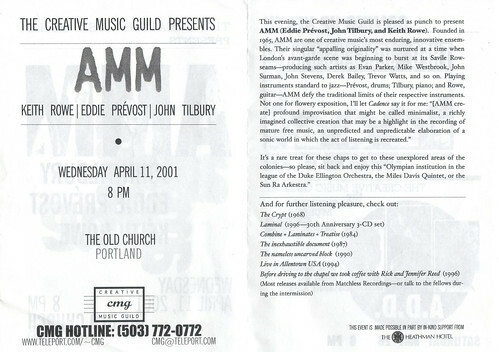 March 2010 I acquired a bootleg of an AMM performance from March 31st, 1990, from the Taktlos Festival in Zurich Switzerland. 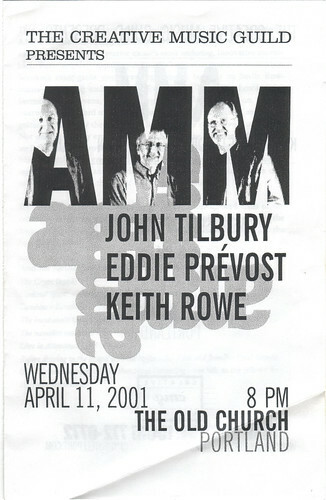 AMM at this show was Keith Rowe, Edwin Prévost, Lou Gare and John Tilbury which of course is the same lineup on the Matchless release The Nameless Uncarved Block. Looking at the linked page for this album we see that it was “Recorded at concerts given in Zurich and Basel organised by the Taklos[sic] Festival, Switzerland, April 1990.” A cursory listen to the two recordings reveal that the Matchless release contains the entirety of this bootleg (the Zurich show) plus additional material presumably from the Basel show. The purpose of this series is to examine the unreleased AMM material and while this exists as a bootleg it is beyond the pervue of this project. It is worth considering boots of released material where there are significant variance in sound or editing or those with additional material. For instance the final AMM show (May 1st, 2004) which I had a bootleg of prior to its official release is about five minutes longer then the official release and it is worth considering the complete performance. So there isn’t too much to say about this one, beyond go pick up the album! While I’m not really a fan of Gare’s work on this one, it does have my favorite title of any AMM release. Anyway a brief analysis of the recording quality and comparing the two releases follows. The bootleg begins with odd stuttered chords from the piano, over which Gare, in quite a tonal mode, layers lower register lines, which become increasingly melodic. Tilbury’s piano then shifts to a jazzier mode and as Prévost begins to tap out a fragmented tattoo on the toms it almost sounds like a jazzy ballad. Only after some time does Rowe come in offering a counterpoint, that shears away from what was previously quite uninteresting. Gare mostly sticks in this more tonal vein, though more fragmented at times as the rest of AMM explore their own language. It weaves between these extremes, neither really giving ground. And yet its not quite as interesting as that contrast makes it sound, it is not as if Rowe tuned in a free jazz sax solo on the radio and let it run in opposition. Gare is too reactive to the group in that sort of call and response style of jazz and not the laminal nature of AMMMusic. The Nameless Uncarved Block on the other hand begins with a skittery laminal sound of tinkled ivories, bowed metal and real subtle un-sax like squeaks from Gare. The first track, Sedimentary, is not contained within this bootleg and most likely is from the Basel shows. The second track, Igneous, seems to begin at around 6’15” minutes into the bootleg, cutting away that ballad-like section. The mix is quite different as well, the drums a lot more buried in the official release and this low, almost bass-like, playing from Rowe a little more present. In fact the mix and the audio quality is so different that it is worth hearing this bootleg as a demonstration of how different this can be. A good example is around 8’30” in the boot 3’15” in Igneous there is a louder more “freak-out” type section that clearly from the boot is a lot more intense than in the recording, whether that was done in post or just a different microphone placement or what have you is hard to say. Igneous runs for 37 minutes and then there is a final track, Metamorphic, which is 7’21” long. This is track is contained in the final track on the Zurich bootleg from approximately 3′ in until the end. Interestingly on the boot there seems to be about 15″ cut from the end but then there is applause. All told the bootleg has maybe 8-9 minutes that aren’t part of The Nameless Uncarved Block. The differences in the recording are the most interesting to me, it sounds as if the boot is an audience recording, though a very nice one, with audience conversation clearly audible during several quiet sections (and possibly why that little bit was edited out at the end). But clearly the person recording this was closer to Gare as he is a lot more up front in the mix and interestingly this recording seems to capture a slight different aspect of Rowe’s playing — less of the subtitles but more of the rumble if that makes any sense. This recording is interesting in that it makes explicit how different a recording can be based on how it is done, where it is done, not to mention editing and any other post processing work. Even at a live show ones position in the audience makes a huge difference. Of course this aspect is only of limited interest and won’t bring me back to it after this initial period of listening. Personally though if I was interested in hearing this concert I’d stick to the official release, it has better balance between the members. 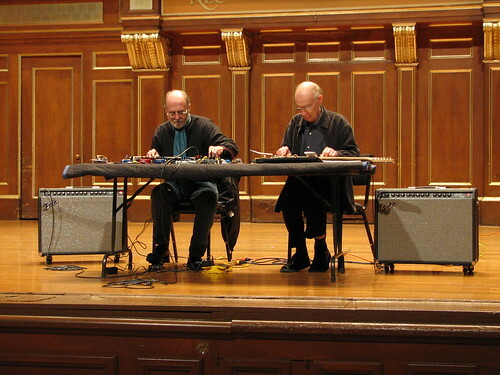 This being the complete performance certainly gives it a documentary interest, but personally I’m not much of a fan of Gare’s more tonal playing with AMM and The Nameless Uncarved Block never gets much play to begin with. A Spiral Cage is powered by	WordPress 4.6.14 and delivered to you in 0.304 seconds using 25 queries.